Ever wanted a checklist to help you check out your bareboat charter yacht? Our very first YouTube episode addresses this part of sailing, and if you'd like an actual checklist, click here and we will send you a pdf. To be clear this is not a customs check-in/check-out. Rather this is the process of receiving a charter boat. Conducting a proper checkout is super important. Why? For starters you’ll be on your vacation. You want to enjoy yourself. And you don’t want to be blamed for damage that was caused by others. So, no stress, no arguments is something you want. But there's more to it than just less stress for the charterer. A good, efficient checkout is also something that the dock-staff at charter companies look for. We figure by sharing some knowledge here, everyone involved in the process will benefit. This list of tips sits alongside the checklist you will get from your charter company. This charter-checklist covers essentials like safety equipment. Make sure you have one of these lists and fill it out. Photos and video are gold. They are time stamped, so they help alleviate arguments better than any other medium. If you have any doubt, snap a photo of it. Then if the charter company asks a question at the end of the week, bring out your phone/camera and have the discussion then. Concentrate on the bow for anchor scratches and transom for scratches brought about by hitting docks. Check the hatches for scratches, cracks and broken hinges. Find the breaker. Make sure it works. Incidentally always have your engine on when using the windlass. Drop and raise the anchor to check it runs fast and strong. How much chain is there? Is it marked? Find this out, and remember, always put out as much anchor chain as you can get away with. When anchor chain is in your locker it is not doing anything to stop you drifting. The old 1:5 water-depth:rode ratios are just a guideline. Put out as much as you can get away with (being aware of swing radius to other boats). Check they pump out; actually test each head. Find the location of the holding tank valve(s). Go over when and how the holding tank should be used. In some parts of the world a vacuum is used to remove the waste from the holding tank. In others the valve is simply opened once the boat is well offshore (various countries' laws stipulate how far offshore. Just ask your charter company if you're not sure). Ask if there has been any blockages of late on this boat in particular. Be strict with your crew on use of toilet paper. Nobody wants a blocked head. 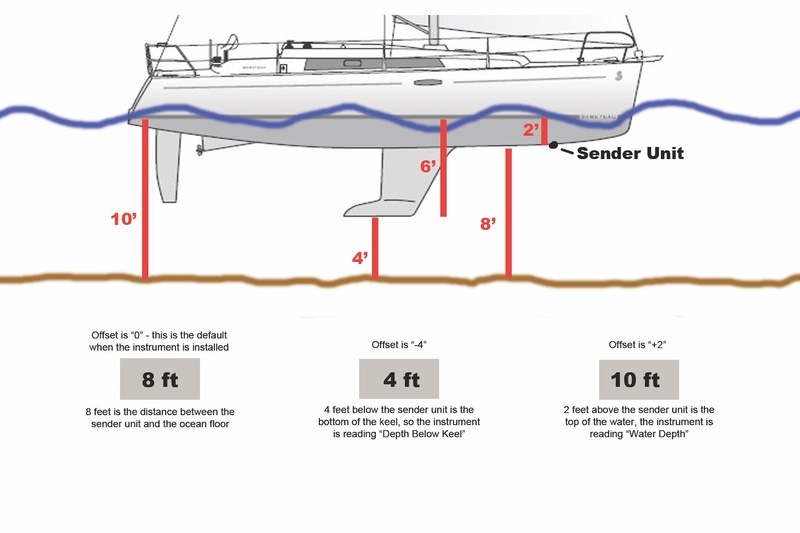 Is depth measured from waterline or bottom of keel? Find this out. Thanks Tradewinds for this image. Where are they? How big are the tanks? The changeover valves will usually be in strange places. Find out and make a record of it (taking a couple of photos will seem like overkill at the time but may come in handy here). You don’t want to run out of water. How much engine do you need per day for recharge? Keep your batteries in charge. It may need 2-4 hours of engine time per day to keep the charge up. Where are all the breaker and parallel switches? If you have a generator, find the breaker switch for this. Where is the gas shutoff valve? And the spare bottle, where is it? Are the bottles full? You can tip them to feel the fluid move inside. But it can still be hard to judge. A handheld scale can help but may be a bit of overkill; just make sure the charter company gives the nod that at least the spare is full. While we're talking shutoff valves, make sure you know where your fuel shutoff valve is. If you have a fire in the engine compartment, you will need to switch the fuel off. This sounds dramatic but all it takes is for an alternator to burn out and you will see smoke coming from the engine. Single line reefing? Slab reefing? In-mast furling? Get them to show you the ins and outs of that particular boat. Then once you get a chance to, put a reef in just to be sure you have it down. You don't want to be figuring things out when a squall is 45 seconds away from hitting your boat. Make sure they work. You don't want to be blamed for other people's blown out speakers. Put some music on and test each speaker. lights (navigation and interior): make sure you know where they turn on and that they work. 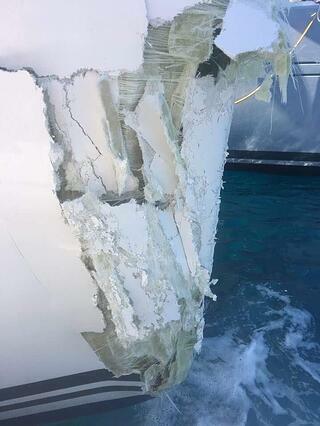 Ask the marina staff what problems this boat has had in the past. Ask this so you know what to go extra careful on. As a bit of an experiment we have put this checklist on a Google Form. Here it is. We'd love to know if you find this useful or not. And one final note, when you come back, if you are very honest with any damage that you may have caused, the marina staff will appreciate it hugely. Chances are they’ll find it anyway (they do this every single week and know what to look for), and it will come across 100 times better if you volunteer it up to them first. Don’t sugar coat it. Just be 100% honest and you’ll be treated well. If you are about to charter a boat, you will need to go through a check in/check out procedure. You may be bombarded with the standard form, so we thought we'd share with your our top ten things to focus on. We hope that you find these tips useful. 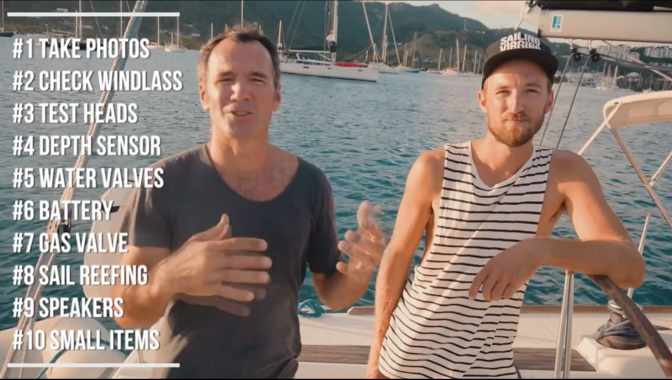 We have had help from some of our Yachtweek brothers for this post and video. Special thanks to: Frazer LaChance, Matt Ross, Michael Crisp, Kit Bottomley, Hugo Pulse. The founders of Sailing Virgins started things as a result of having some incredible sailing seasons in the Mediterranean and Caribbean working for sailing company The Yacht Week. James then worked for and for a while managed Tortola Sailing School. In 2016 he branched off and started Sailing Virgins. We LOVE how sailing is changing. Top speeds in the America’s Cup were thirteen knots not so long ago. Now they’re 45 knots. If you’re excited by that, we’re with you. Giddy up!